As an organism grows and responds to its environment, genes in its cells are constantly turning on and off, with different patterns of gene expression in different cells. But can changes in gene expression be passed on from parents to their children and subsequent generations? 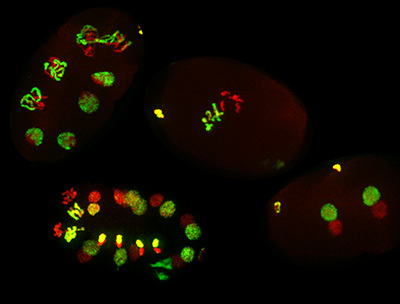 Although indirect evidence for this phenomenon, called “transgenerational epigenetic inheritance,” is growing, it remains controversial because the mechanisms behind it are so mysterious.Now researchers at UC Santa Cruz have demonstrated that epigenetic information carried by parental sperm chromosomes can cause changes in gene expression and development in the offspring. Their study, published March 20 in Nature Communications, involved a series of clever experiments using the nematode worm Caenorhabditis elegans. Epigenetic changes do not alter the DNA sequences of genes, but instead involve chemical modifications to either the DNA itself or to the histone proteins with which DNA is packaged in the chromosomes. These modifications or “marks” change gene expression, turning genes on or off. In their experiments with C. elegans, researchers in Susan Strome’s lab at UC Santa Cruz have focused on histone marks, modifications to specific amino acids in the tails of histone proteins. Strome, a professor of molecular, cell and developmental biology, said the new study addressed a central question in the field of epigenetics.